Traditional slash-and-burn agriculture has a high environmental impact, and is still used in many parts of the world. This practice contributes greatly to deforestation in the developing world. We rarely hear positive stories about the environment, despite the fact that there have been promising improvements in some areas. One of these areas is in the forestation of the wealthy Western nations. Forests are actually increasing across the West! The story of mankind since the neolithic revolution has been one of deforestation. Throughout history people have practiced “slash-and-burn” agriculture, clearing forests and plowing the organic matter into the soil. As humanity has expanded the forests have continued to retract, harvested for fuel and cleared for agriculture. This is a process sped up greatly when Europeans moved across the world in search of land and resources. The need for wood fuel increased even further with the advent of the steam engine, which requires a high amount of fuel. With increases in agricultural productivity, new methods of power, and the de-industrialization of the West, forests have been returning to previously cleared areas. In some areas, such as New Hampshire, this process started over 100 years ago. The return of forests in previously farmed areas was a major inspiration to the works of the great American poet Robert Frost. However, while this was going on, virgin land was still being busted out across the nation, and the Mississippi wilderness was continuing to retract to nearly nothing. Gougane Barra Forest, Ireland. Photograph by Jen Shook. Now, forests are returning across the West, due to an increased interest in environmentalism and the soil degradation of sub-par farmland. However, even afforestation has critics, as detailed in the article “Trees are Covering More of the Land in Rich Countries” published in The Economist. The article starts with the example of Ireland, which almost completely lost its trees by end of British rule. This is the story the world over. It has been worse on islands with limited space. The deforestation was also the worst in areas with large scale colonial land owners with less interest in the long term health of the land. This story is playing out throughout almost all of Europe, however the numbers are the most dramatic in Ireland due to extensive deforestation. In the United States forests have grown by 2% in the last decade, though you never hear about it. While it is sad to imagine these people abandoning their previous life styles, in reality these people have lived various difficult lives and generally desire the amenities of a more modern lifestyle. These were relatively unproductive uses of the land and the people continued to live in poverty. The land being abandoned to wilderness is all well and good if it is happening for the right reasons. Looking at these descriptions, all of these relate to foreign policy. Basically, it’s too damn difficult to get along with other countries to rely on anyone else for wood production, despite the fact that countries are drastically differently suited to wood production. Now, forests are valued for environmental concerns as much if not moreso than for timber. Not only do forests absorb rainwater and store carbon, they clean air and provide valuable habitat. Because of these things, government has decided that manipulating land use in favor of forests is good policy. This shows the danger of trusting the government to take part in environmental policy. There are literally people dying because they didn’t have the ecological sense to think about downsides of mass planting an invasive tree. And why should they? What does the World Bank know about the environment, outside of how to loot it? In Ireland, forest opponents resent the changing landscape and increasing costs of arable land. The government of Ireland has created a situation where there will be perpetually less farmland by ensuring land that is converted to forest remains forest. This creates understandable resentment among farmers. While it is positive that Ireland is actually encouraging the harvest of trees and still making economic use of the land, this is an egregious affront to property rights. What makes it worse is the system encourages high amounts of corporate land ownership. As the article explains, “Forestry subsidies and regulations have indeed distorted Ireland’s land market. Farmers who plant trees get generous payments for 15 years, while continuing to receive ordinary farming subsidies. At that point, with perhaps 20 years to go before conifers are harvested, they often sell to pension funds and other investors.” This means that that when the program is over the land moves out of the hands of farm families and becomes owned by financial interests. Given how long the Irish peasants fought for land ownership, it seems a little bit rich to create a system that encourages farm land to be sold to hedge funds. The absurdity of this whole thing is that there is no reason forest land needs to be devoted only to that use. In a climate of sufficient moisture and warmth the land can often be put to environmentally and economically better uses. In Ireland, some of the farmers planting trees are aging and don’t have the energy for more intensive agriculture. But there is no reason, in general, that woodland cannot also be a source of food. Woodland is an essential part of a self-sustaining homestead, as well detailed in “The Owner-Built Homestead.” Further, many tree crops can grow largely unattended, some crops can be interplanted, and livestock can make use of woodlands. There are also good reasons a farmer would vary which part of their property is currently woodland. This means sustainable farmers require the flexibility to remove land from forest as necessary, which has been banned in Ireland. The fact is that in most instances there should be some woodland associated with farmland if possible. This land should not be monoculture tree plantation, but should be allowed to develop in a mostly natural fashion while clearing out undergrowth with livestock. Many nuts and fruits naturally grow very tall, and can serve as the main canopy layer of a forest. 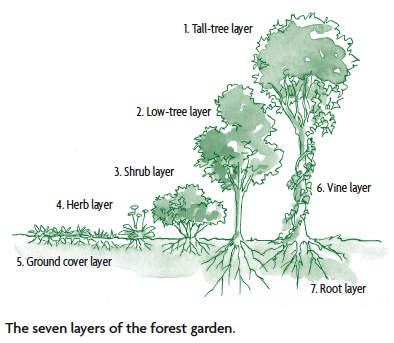 One of the well known forms of a forest garden is the seven layer garden. While this is not ideal for timber production, it is far better for wildlife and the other reasons forests are ecologically important while also producing a high volume of food. These kinds of permaculture designs are the best use of land for humans and nature. People like the idea of wild, unmanaged nature, but if nature had ever reached homeostasis it has not again since the Columbian Exchange. Nature needs man to care for it, especially if man is to live off of nature’s resources. While the progress in reforestation isn’t perfect, and some people are upset by changing landscapes, the reforestation of the West remains a bright point in a world full of ecological problems.